Workers in a production facility don't generally have access to a computer to receive company notices and emails..
Digital Signage and Internal Communication assists in the dissemination of information to all staff at a production facility by displaying information in key locations. Command digital signage solutions can be installed inside and outdoors such as Production areas, Administration areas, Meeting Rooms, General Access areas, Training Rooms, Security and break-out rooms. The system can be managed by a single person or department or spread across multiple departments for the purpose of updating information to various sites. With the built-in User Access Controls, Navori digital signage software can restrict users to accessing a single screen or a zone on a screen. The multi level of access allows the display of concurrent playlists which could be managed at a Corporate Level, Department Level and Local Level, combining all media files automatically on output. 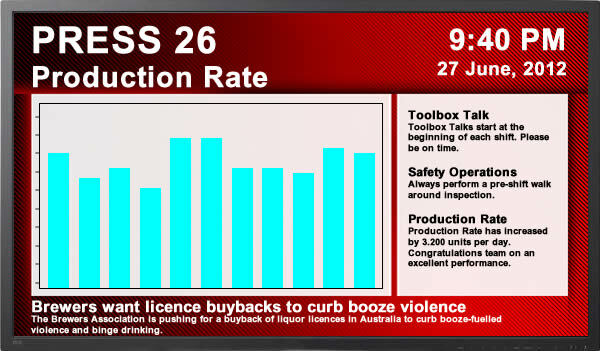 Digital Signage is the ideal platform for displaying Production Reports, Targets, Breakdown and Warning information. Additionally, OH&S Training, Security Messaging, Alert Messages and General Information can be displayed on your screens. Navori digital signage software can receive data from a third party application, such as a database or production reporting system, and display that information automatically on the screens. All staff benefit from the information and can assist in increasing safety and productivity.